The first person in South Gloucestershire to sign up for the Wheels to Work scheme has now successfully completed the programme. 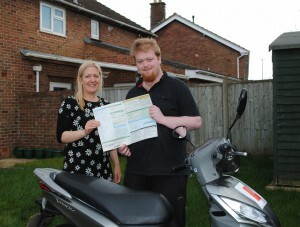 A year on from joining the scheme and starting his new job, 21-year-old Brandon Rowat from Alveston is the first person in the area to fully repay his loan and take ownership of his scooter. Brandon uses the scooter to travel from his home to his job as a trainee at wood importer and distributor Lathams Ltd in Yate. Before signing up to the scheme, his only way of attending job interviews and getting around was by relying on his father and his employment support worker for lifts. Brandon has now been working for 12 months and has his own independence through the scooter. Since Brandon secured his job, his father has also found employment himself and the whole family has benefited. The scooter was financed through an interest free loan and presented to Brandon through the Wheels to Work West scheme which helps unemployed and newly employed workers with transport to get to interviews, training and their workplace. As well as his new scooter, Brandon also received free insurance, road tax, training and protective clothing. Brandon has Asperger Syndrome, a form of autism. Before joining the scheme, he had been unemployed since leaving school and was struggling to find work as his condition means it is difficult for him to communicate with new people. Brandon’s father requested assistance from the Employment Support Service at South Gloucestershire Council who helped him apply for his new job. Brandon’s local JobCentre then introduced him to the Wheels to Work scheme, a project which has been developed under the Local Sustainable Transport Fund (LSTF). One of the sustainable travel options available is a motor scooter loan to buy scheme with no upfront costs. Once a job offer has been secured, applicants to the scheme receive the interest free scooter loan (through Bristol Credit Union), their Certificate of Basic Training (CBT), road safety training, insurance, road tax and protective clothing (including helmet, jacket, trousers and gloves). That’s everything they need to get on the road, and once the loan is repaid, the scooter is theirs to keep. Wheels to Work can also provide free bus tickets and loan bikes. The idea is not only to help financially at a difficult time, but also to establish habits in sustainable travel. It particularly suits people who work unusual or irregular hours, people in rural locations, and those who need to make multiple journeys as part of their work.